Join us for the second in a three-episode series on network virtualization and how to move from hardware-centric to software-centric networking—without disruption to your existing environment. Enable networking and security at the speed of software while building datacenter agility with network virtualization on industry standard Intel® Xeon® processor based server architecture. Data breaches, cyber-attacks, security lapses and new regulations have made IT security more challenging than ever now that every organization has gone digital. IT teams are struggling with points solutions, as the traditional security approach no longer works. Explore how VMware makes cyber security intrinsic with a footprint throughout IT organizations with a security solution that includes products such as Workspace ONE, AirWatch, Horizon, NSX, AppDefense, vSphere, vSAN and vRNI that simplifies and consolidates IT security. Also, learn about what’s new with NSX and our newest security solution AppDefense. Technical Demo’s will include looks into the Horizon with NSX solution, and how it interacts with 3rd party solutions such as Trend Micro’s Deep Security to automate security processes. You will also get a look into the vRealize Network Insight tool, and how it is helping our customers operationalize these new security models, maintain operational visibility into the network, and ensure best practices and health of the networking and security services. VMware transforms security by providing a ubiquitous software layer across application infrastructure and endpoints, maximizing visibility and context of the interaction between users and applications, aligning security controls and policies to the applications they are protecting, and enabling the insertion of third-party security services for additional intelligent protection. Mobility is a key driver in the consumerization of IT, leading to high expectations for IT to securely manage the influx of mobile devices and apps across networks. Cybersecurity threats are on the rise as the surface area of attack has expanded to mobile devices. Organizations need a solution in place to help accelerate mobile app delivery and automation while reducing the mobile access footprint and attack surface within the datacenter. VMware AirWatch and NSX integration provides that solution to help organizations extend security from the mobile device into the datacenter. Many organizations implement desktop and application virtualization to improve security and deliver greater employee mobility. Centralizing desktops and applications protects data at rest, prevents unauthorized application access, and provides a more efficient way to patch, maintain and upgrade images. However, with desktop and application virtualization, new security concerns can arise behind the data center firewall—where hundreds or even thousands of desktops reside. These desktops sit in close proximity to other users and mission-critical workloads, requiring protection from attacks. These attacks can move from desktop to server, exposing a large attack surface within the data center. VMware NSX for Horizon effectively secures east-west traffic within the data center, while ensuring that IT can quickly and easily administer networking and security policy that dynamically follows end users’ virtual desktops and apps across infrastructure, devices, and locations. Cybercrime is growing fast—and traditional security solutions aren’t up to the task of slowing it down. Organizations are pouring huge amounts of time and money into perimeter-centric security, but that’s not adequate on its own anymore. It’s time for a new solution—one that starts with network virtualization and extends to enabling micro-segmentation for data center protection that can handle modern threats. In today’s complicated security landscape, perimeter firewalls don’t provide adequate protection for agile applications, diverse environments, and rapidly multiplying users. To defend against sophisticated and costly attacks, IT needs to take a transformative approach to security. Micro-segmentation enabled by network virtualization provides the persistence, ubiquity, and extensibility needed to build a strong defense. Applications drive modern business—and keeping them safe is a big priority for organizations across every industry. But as the digital economy continues to change the way applications are run and managed, IT teams must juggle traditional, virtual, and next-gen apps on a variety of platforms and environments. Perimeter-centric security simply can’t keep up with the diverse demands and threats. It’s time for a transformation that enables granular security that follows applications whether they’re on- or off-premises. You are probably using NSX for its micro-segmentation and network virtualization features, but did you know that NSX also includes an extremely robust and flexible load balancer that’s perfect for use in your software-defined data center (SDDC)? In this master class, we will review load balancing and provide demonstrations and ideas to help you get started with the NSX Load Balancer. In this session, we will bring an NSX infrastructure online in a running physical environment – a powerful example of migrating to a virtual infrastructure with no downtime. We will discuss the linking of physical devices to the edge services gateway and configuring routing protocols on network devices and in the NSX environment. We will also explain why a clear knowledge of your ecosystem, from the physical switch on up, will help you better understand how the overlay and the underlay come together. This master class picks up after the software has been installed, at the point when you need to start securing and passing packets in your environment. - A deep dive into setting up the physical and virtual network infrastructure. - Demos you can follow to get NSX quickly running in your environment. The best actors don’t film an entire movie in a single day. The same is true for ‘bad actors’ in your data center: they don’t attack the whole data center at once, but start small and branch out rapidly. With this approach, they can make traditional segmentation methods ineffective. The key to cyber security is to always expect a counter move. You need to make your data center operate dynamically, just as your threats do, yet remain flexible to support your applications. In this session, we will look at methods to operationalize east-west security in ways that ensure scaling and flexibility don’t become an increased burden on your IT staff. Network and security operations traditionally have been handled by two different operations teams, although much of the same operations data is used, but differently on whether the operations team is troubleshooting a connectivity problem, or a security breach. Log data, traffic data, and API based data from the various different network devices are used by both Network and Security operations. vRealize Network Insight (vRNI) offers use cases for both teams, all from the same data collection sources. Series Abstract: Join VMware NSX experts for a series of short webcasts focused on the technology and business drivers around network virtualization. Using a lightboard, we’ll illustrate how network virtualization with NSX can support an organization’s strategic initiatives. Abstract: Learn how to deploy intelligent networking and micro-segmentation for VDI and extend these capabilities to secure mobile apps and devices. We’ll demonstrate how VMware NSX can help you manage virtual desktop user access, and how to limit users from jumping off one server to another. You’ll also learn how to apply a few easily managed rules in your data center that can reduce your attack surface with policies that dynamically follow virtual desktops. In the second part of the session, we’ll explore how the integration of AirWatch and NSX allows you to extend security from your mobile devices and applications to their data center resources. Vallejo Sanitation and Flood Control District, located in California, has moved to the next level of virtualization with VMware NSX. Join us to see how they have ventured into network virtualization to transform their physical network into the logical realm with integration of VMware NSX, AirWatch, and Palo Alto Networks. NSX network virtualization represents a major advancement in helping organizations realize the benefits of speed, agility, and security. Enterprises are using VMware NSX to achieve game-changing operational advantages. In this webinar we will cover the NSX Operations Maturity Model that spans across people, process, and tooling – including general operational guidance and best practices based on real world implementations. This unique webinar is ideal for IT executives and managers who want to understand what it takes to operationalize NSX. It is also useful for networking and security professionals in architecture, engineering, and admin/ops who will participate in operationalizing NSX for their organization. - Gain a basic understanding of the NSX Operations Maturity Model and what it takes to successfully operationalize NSX across people, process, and tooling. 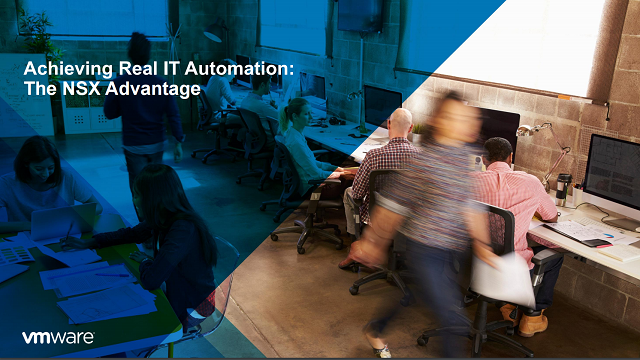 - Learn about the real-life best practices customers are using to operationalize NSX, as well as the resources and services VMware offers to help you on this journey. - Learn how to approach your transformational journey gradually, by starting small and taking incremental steps towards a more mature end state. Micro-segmentation enables security architects and practitioners to implement granular policy driven security and visibility. Join this session to learn how to plan a security strategy around micro-segmentation using VMware NSX. This includes guidance to plan, design, and implement security policy utilizing micro-segmentation. Join us and learn how to use micro-segmentation to transform security in your virtual networks. If you feel like you’re being held hostage to a data center operational model that no longer delivers, learn how virtualized networking using NSX can transform your day-to-day work and deliver the business outcomes expected of IT. The abstraction of functionality from hardware into software also frees IT from the compromises between speed and security, or between security and agility. Don't miss this opportunity to hear about the various use cases and IT outcomes of VMware NSX. Abstract: Deploying NSX across multiple datacenters allows organizations to dynamically move and manage workloads between multiple physical locations. The benefits of this capability are immediately clear: workload mobility, resource pooling, central management, consistent security policies across vCenter domains/sites, and disaster recovery. In this session, we’ll illustrate use cases and capabilities, including L2 connectivity without the use of OTV, cross-data center security policies, and isolating networks for disaster recovery testing and validation. In the second part of the session, we’ll dive into how NSX can improve your business disaster recovery plan and strengthen your overall RTO. Abstract: Are you interested in deploying micro-segmentation but not sure where to start? One of the challenges is acquiring a complete picture of what’s going on within the datacenter and understanding your network flows. We’ll show you how to collect and analyze network flows in real time with vRealize Network Insight, providing vital context into the virtual machines and the applications they are originating from or terminating to. Once you understand who is talking to whom and which flows need to be allowed or blocked, you can use that intel to effectively model security groups and firewall rules, making micro-segmentation easier to deploy. Watch Hadar Freehling, VMware staff security strategist, as he discusses how virtualization — via NSX — can be powerful tool in your enterprise’s overall security efforts. You’ve chosen NSX, but what’s the best way to get started? Watch as Julie Starr, VMware Security Strategist, discusses micro-segmentation and how it can accelerate your NSX distributed firewall implementation.